This article first appeared in The Edge Financial Daily, on December 21, 2015. THE managing partners of Regal Valet (RV) last Thursday took press journalists on a media tour to showcase its latest one-stop, all-solutions flagship vehicle aesthetics care centre at the bustling Sungai Penchala auto hub in Jalan Damansara, Kuala Lumpur. Completed in February, RV’s biggest and latest flagship studio replaced both its Taman Tun Dr Ismail (TTDI) and Bangsar outlets, enabling substantial concentration of capital expenditure and consolidation of resources. Slated to be among the largest and most complete stand-alone car styling centres in the country, this purpose-built facility on a vast piece of hillside land offers car-loving enthusiasts a totally brand new experience within a secure and conveniently located destination by a trusted brand name. Indeed, the unique set-up at RV Damansara with dedicated areas for different services is said by many visitors to be a refreshing change from run-of-the-mill workshops that are typically small, dirty and a little uncomfortable. The spacious premium lobby lounge, plus its prime location within a private guarded compound along a stretch of exclusive car showrooms, allows discerning customers — especially the growing base of women drivers — to arrive with confidence, linger around in comfort and leave in style. Established in 2010 at its very first location in TTDI, RV set out to become the premier destination for car owners looking for a reputable operator with an array of unique services and quality offerings. Key to RV coming into being was the fact that there had been an increasing number of vehicles on the roads with more and more demanding car owners, but only a handful of professional car care centres doing things the right and proper way. 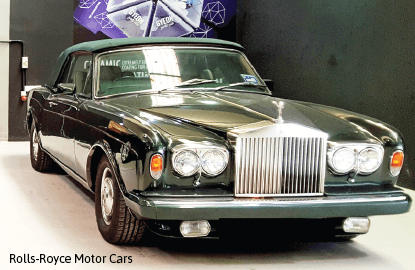 It didn’t help that Malaysia was also typically known to lag several years behind the European and US markets in terms of car styling trends and auto care advancements back then. Large segments of the consumer market were accustomed to cheap services done in minimal time, not realising that professional auto detailing work requires long man-hours, expensive tools and equipment, plus more specialist-grade materials. All of this results in significantly higher costs than what they had been led to believe. What formed RV’s key differentiation and core reason for existence over the years had been its priority in delivering consistent quality and a higher service standard for all its customers. Unlike standard operators keenly focused on a quick turnaround and high volume to sustain their business, RV’s premium positioning and specialised core offerings ensure a personalised experience for every customer and complete attention on each vehicle. Generating tangible value and great returns on the client’s investment has become a standard requirement for every new project undertaken. Today, as an established brand with unmatched credentials and a proven track record, customers can expect to find premium auto care solutions including professional car wash, auto detailing, interior care, restoration works, window tinting and other car styling services for every type of vehicle. RV also owns an off-site paint and bodywork facility, RV Sprayworks, which provides complete makeovers with custom colours, respraying and general repair services. RV is especially renowned for its expertise in advanced paintwork recovery, permanent shine and protection systems by internationally award-winning brand Gyeon Quartz. As the exclusive distributor and certified detailer of Gyeon Quartz in Malaysia, RV’s customers now have access to the latest specialist car care solutions with the most advanced innovations and effectiveness that are guaranteed to work and proven to last in harsh and unpredictable weather. Gyeon Quartz SiO2-based ceramic coating systems simultaneously protect and enhance the appearance of automotive paint with internationally acclaimed performance and industry leading durability. The products are available in a complete range, making it possible for car owners to choose the most ideal ones based on their individual needs, budget and requirements. Gyeon Quartz ceramic coatings have passed rigorous testing and are officially certified by the world’s two leading verification, testing and certification companies, the Korean Testing and Research Institute and SGS Taiwan. Gyeon Quartz has had many of its signature products consistently voted among the best in the world within many different categories at the annual Detailing World Product Awards in recent years, clearly showing that its products are proven both in the lab and out in real life applications.